Dressage for the Non-Horsey Boyfriend -Part 4: Canter I or can't I? Until only a few weeks ago, the canter was our weakest spot: for me, because timing and seat did not work out, for Hafl mainly because of strength issues. It was horrible thinking of canter in the test – gave me stomachache! I hope that we are past that now as I can not stop cantering at the moment and really feel pretty confident. One of the main issues we had was rhythm – and right now, at least it feels good. So let us take a look WHAT exactly canter should look like from the sidelines. 1. The canter is a three (3)-beat pace where, in canter to the right, for example, the footfall is as follows: left hind, left diagonal (simultaneously left fore and right hind), right fore, followed by a moment of suspension with all four (4) feet in the air before the next stride begins. One of the most common mistakes especially for young horses or those not yet strong enough under saddle (or, if your name is Hafl), is a four beat canter – horses cantering in front, trotting behind. Once a trainer told me: well, it will take you a year to get that canter right. And she was true, it even took longer. The problem is that, after the accident back in 2010, cantering was rather stiff and anxious from my side. Too much rein action led to canter on the forehand, resulting in high speed Hafl running around the arena, holding his teeth tight and not letting any attempt of half halt through – not that I was able back then to RIDE a proper half halt in canter. Me trying to avoid any leg aids (though he would have needed them so desperately) and pulling only did not help at all. Doing this for years caused a pattern in how we cantered – and as all of you know, it normally takes ages to get of old patterns. Only slowly judges’ comments changed from “Four beat” to “Uphill tendency”. 2. The canter, always with light, cadenced and regular strides, should be moved into without hesitation. Interestingly enough, the canter depart was never a big issue. Neither from trot nor from walk. As Hafl was always pretty light on the aids, transitions INTO canter were not the issue but the other way round – which is of course no surprise. A horse not sitting on his hind legs has massive problems to take on MORE weight on them to properly transition from canter to trot or walk – it is simply physics! Try to run downhill with your upper body leaning forward and stopping immediately after gaining speed – stopping at all seems to be impossible. And the same is true for horses, even more with some extra weight on their back. Making your horse sit more in canter with spiral ins, many transitions, better preparation in trot (shoulder in at its best) are preconditions for successful downward transitions. Also for horses that have problems with upward transitions, riding more of them will make them lighter on the aids whereas cantering for hours and hours will not improve their “laziness”. In my case, it was also important to find the right balance in how long we cantered: Cantering too much would cause him to get even tenser as he would get tired. Cantering not long enough would simply not lead to the buildup of necessary muscles, strength and balance. So a good compromise (also for me as I would get tired from pulling even earlier!) is to change position: Several rounds around the arena in hunt seat as well as going on a hack with lots of uphill canter will help. Also today, I still keep the periods of “exhausting” meaning sitting canter short and let him canter in a slightly forward down and out position in hunt seat as a reward. Make sure that your horse is not cheating and falling on the forehand! 3. The quality of the canter is judged by the general impression, i.e. the regularity and lightness of the steps and the uphill tendency and cadence originating from the acceptance of the bridle with a supple poll and in the engagement of the hindquarters with an active hock action – and by the ability of maintaining the same rhythm and a natural balance, even after a transition from one (1) canter to another. The Horse should always remain straight on straight lines and correctly bent on curved lines. We also had major issues with a supple poll in canter: as there was no leg and driving aid from my side, Hafl was only leaning on my arms – acceptance of the bridle 0. A result of this was often times that the hindquarters where simply gone when changing between straight and curved lines. 4. The following canters are recognised: Working canter, Lengthening of strides, Collected canter, Medium canter and Extended canter. 4.1. Working canter. This is a pace between the Collected and the Medium canter, in which a Horse’s training is not yet developed enough and ready for collected movements. The Horse shows natural balance while remaining “on the bit”, and goes forward with even, light and active strides and good hock action. The expression “good hock action” underlines the importance of an impulsion originating from the activity of the hindquarters. 4.2. Lengthening of strides. In the test for four (4)-year-old Horses "lengthening of strides" is required. This is a variation between the Working and Medium canter in which a Horse’s training is not developed enough for Medium canter. 4.3. Collected canter. The Horse, remaining “on the bit”, moves forward with the neck raised and arched. The hocks, being well-engaged, maintain an energetic impulsion, enabling the shoulders to move with greater mobility thus demonstrating self carriage and an uphill tendency. The Horse’s strides are shorter than in the other canters, without losing elasticity and cadence. 4.4. Medium canter. This is a pace between the Working and the Extended canter. Without hurrying, the Horse goes forward with clearly lengthened strides and impulsion from the hindquarters. The Athlete allows the Horse to carry the head a little more in front of the vertical than in the Collected and Working canter, and at the same time allows the Horse, to lower the head and neck slightly. The strides should be balanced and unconstrained. 4.5. Extended canter. The Horse covers as much ground as possible. Without hurrying, the strides are lengthened to the utmost. The Horse remains calm, light and straight as a result of great impulsion from the hindquarters. The Athlete allows the Horse to lengthen the frame with a controlled poll and to gain ground. The whole movement should be well-balanced and the transition to Collected canter should be smoothly executed by taking more weight on the hindquarters. 4.6. Counter–canter. The Counter canter is a balancing and straightening movement that must be executed in collection. The Horse canters in correct sequence with the outside foreleg leading with positioning to the side of the leading leg. The foreleg should be aligned to the same track as the hind leg. 4.7. Simple change of leg at the canter. This is a movement in which, after a direct transition out of the canter into a walk, with three (3) to five (5) clearly defined steps, an immediate transition is made into the other canter lead. Not a flying change AGAIN! Yesterday, I guess I was cantering for almost 40 minutes and all of a sudden it made "CLICK" and we got it! 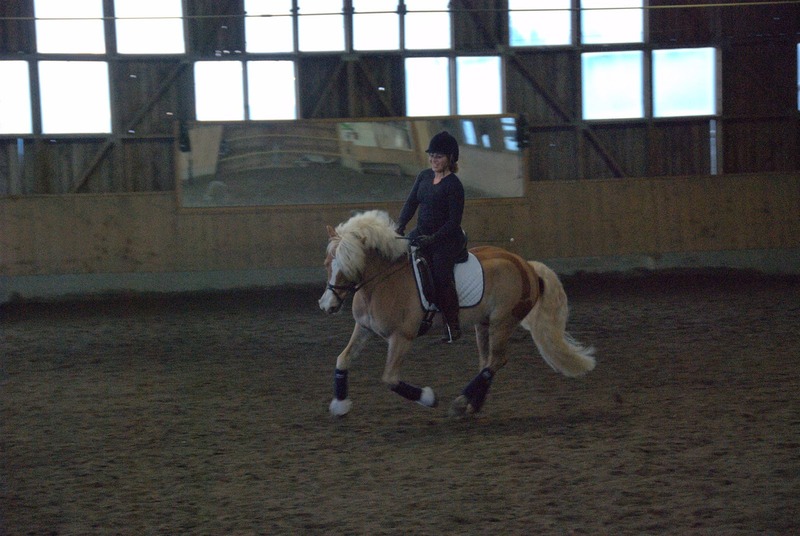 Not only that I think we got it, we had a lesson today and also my trainer said that we got it! So, how could that happen? Face your problems and work on them. It might seems like nothing happens - even for months of training - but do not stop as there is probably just a tiny tiny thing that needs to be discovered such that it "clicks". The feeling afterwards is unbelievably great! Though I have to admit I have never had such aching muscles and felt so tired after cantering than I did yesterday - Hafl was pretty dead, too.